It’s the motocross story of motocross stories. Derek Natvig and Mercedes Gonzalez were both very fast racers, and that shows in their results at the AMA Amateur Nationals at Loretta Lynn’s Ranch, where each have collected titles. They met, they married, and they went on to continue to contribute to the industry. Today, Derek Natvig is the senior race marketing specialist at Kawasaki, a company he has worked for since his racing days ended—all the way back in 1994! He and Mercedes married in 1998. 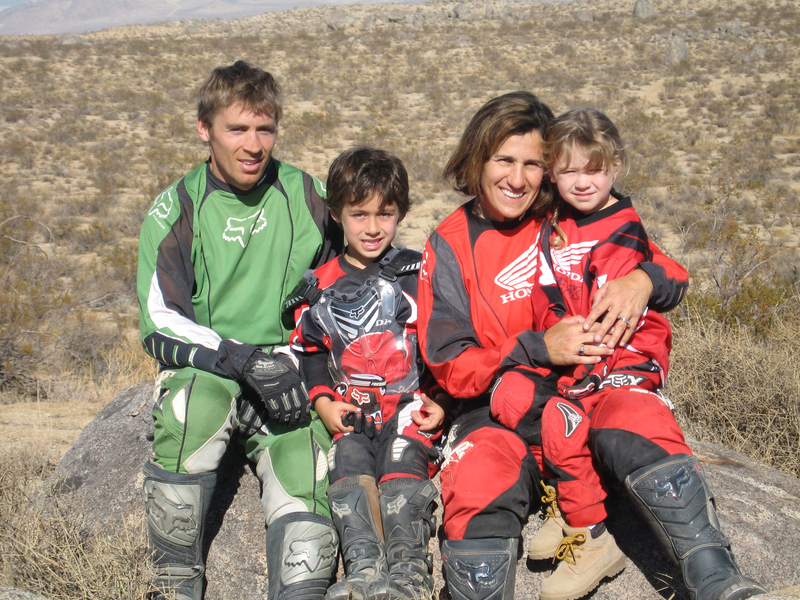 She transitioned from motocross racing to off-road driving with the old Mickey Thompson Stadium Grand Prix Circuit, then to mountain bike racing. When she decided to settle down, she took a job with Honda that she still holds now—working at the Honda Rider Education Center in Colton, California. You’ve probably noticed their work: Honda sets up learn-to-ride events in the pits of select rounds of Monster Energy Supercross, and Mercedes is a big part of organizing that program. If you watch Monster Energy Supercross on television, you’ve surely watched Kawasaki’s Science of Supercross features. Derek is a big part of that program. Derek is a behind-the-scenes man with Kawasaki these days, but he was very fast when he was behind the bars of a dirt bike. Natvig was part of the SoCal scene back when it seemed like every factory rider came out of there, and he could measure right up to the best, winning a 125 B Modified Championship at Loretta’s in 1989 and finishing second in 125 B Stock. He also finished second in the 125 A class in 1993. A crash when he turned pro left him paralyzed for six months, but he was able to make a recovery and not only walk again, but ride and race again. He also started in a research and development role with Kawasaki, and that opened the doors to his current career. Mercedes, meanwhile, is the GOAT of women’s motocross in the eyes of many. She won five Women’s Championships at Loretta’s, and her battles with Michigan’s Lisa Akin Wagner are the stuff of legend down in Tennessee. She set a standard for women’s racing that still stands today—next week at Loretta’s, someone is going to bring up her name as one of the best to ever race at the Ranch. What’s even cooler is that both she and Derek won titles in the same year—1989. Mercedes also won in 1986, 1987, 1990, and 1991. After that, she essentially left women’s motocross racing on top. You can learn more about Mercedes and Derek with our recent Where Are They Now features, here on Mercedes and here with Derek. We need this in America immediately!